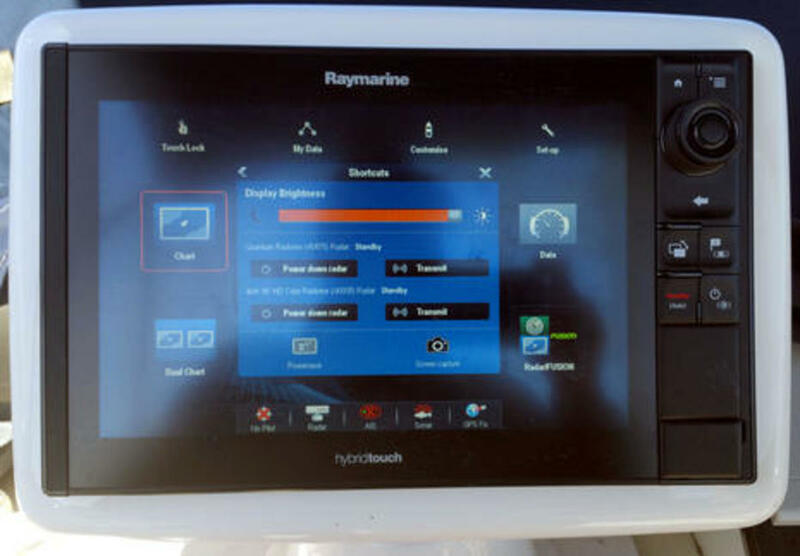 Let&apos;s look first at the Raymarine Quantum Q24 hardware. At 21.3 inches in diameter and 8.25 high, the radome is wider but lower than the Simrad 4G radar on which it&apos;s temporarily installed, and it only weighs 12.3 pounds. I appreciated all that because in order to test the Quantum&apos;s WiFi data connection with the flybridge eS128, I moved it around to more difficult locations like the aft cockpit. It was only happenstance that Gizmo&apos;s tired old 1,200 Watt microwave oven was also there (on its way to the recycling center), but it&apos;s pretty amazing how the Quantum really can reach its 24-mile maximum range with just 20 peak Watts of compressed microwave pulses drawing 17 Watts of 12 (or 24) volt DC boat power. It wasn&apos;t clear when we first discussed the new Quantum in January, or even when demoed in Miami, but there are two distinct Q24 models. What I received for testing is the orginally announced Q24C that can make its data connection with either WiFi or Ethernet, specifically part number E70210, which does not come with an Ethernet cable (though Raymarine added the 10m one seen inset) and which typically retails for $1,549. 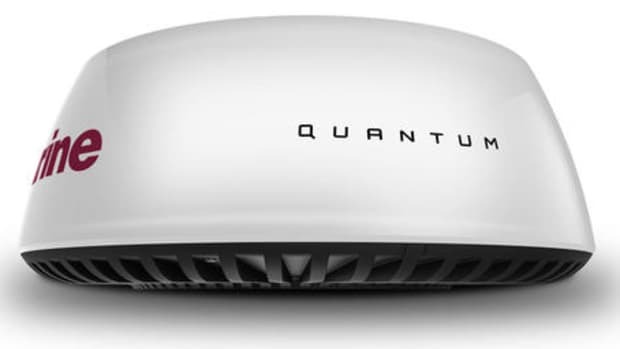 However there&apos;s also a Quantum Q24W (E70344) that is WiFi-only and $200 less expensive. Not all retail outlets are clear about the differences, and the WiFi-only model presents a conundrum for installs where the WiFi connection may be dicey. More on the WiFi next, and note the Quantum SSID and Passcode on the label above, but before we leave this collage, also note the multiple bolt locations to fit different radar mounts. 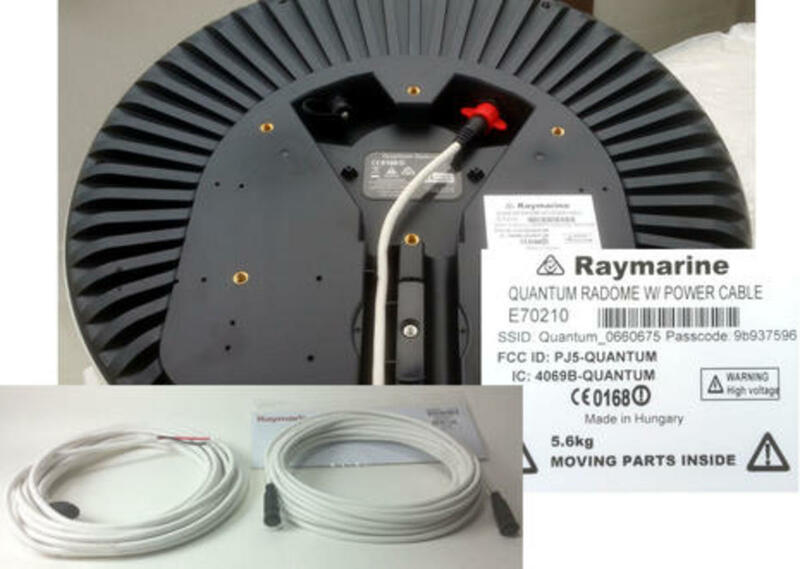 The Quantum is designed to easily replace any old radome since you probably only need the power wires already run to the mount (or if your old dome used a single Ray digital cable, there&apos;s a power and Ethernet adapter). So this was a first in my marine electronics installation experience, and it may have taken more than one try because my old brain is not good at copying meaningless passwords. It would be nice if Ray let you click a box to make the password visible, like many modern apps do, but the bigger news is that once my test Quantum connected with the eS128 display, it has run rock solid for over two months. On power up the WiFi connection did take a little longer when I had radome in the cockpit (with a lot of structure in between) and longer still when I hid it in the cockpit of the boat that shares my float, but as mounted on Gizmo it&apos;s nearly instantaneous. But what if there&apos;s 50 feet of air and a fiberglass cabin top between the Quantum radome and your Raymarine MFD? 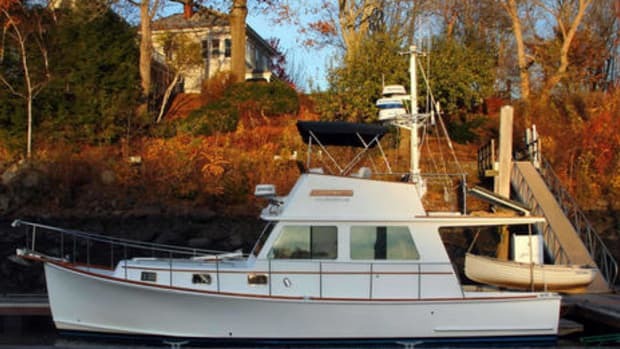 Ray&apos;s Quantum install manual is very thorough on this subject, and while it suggests that such a scenario will work, it also calls for a careful site survey, including a sea trial in case a neighboring boat&apos;s structure is providing a WiFi bounce. If in doubt, it would seem prudent to purchase a WiFi-only Quantum with return privileges. 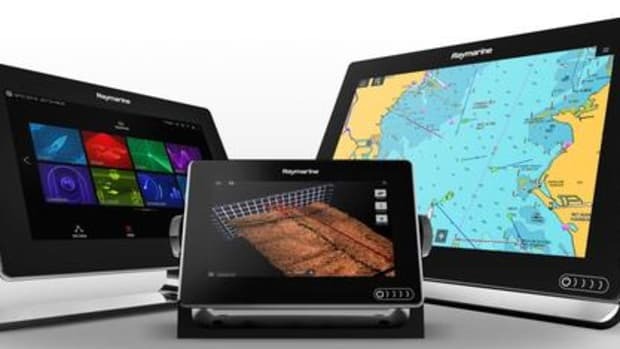 But if the Quantum WiFi connection is as solid on your boat as it is on Gizmo -- and mind you the range is purportedly over 300 feet in optimal conditions -- you may be amazed at how well it fits into Raymarine&apos;s overall wired and wireless networking. While it wasn&apos;t surprising that the older a78 MFD (above) at my lower helm gets the Quantum over Ethernet from the eS128 -- Ray&apos;s whole MFD line has remained highly compatible -- it blew my mind when I realized that it could make the Quantum connection even with the eS128 turned off and no effort on my part. Once you teach one network MFD how to connect with a Quantum, it teaches the others! 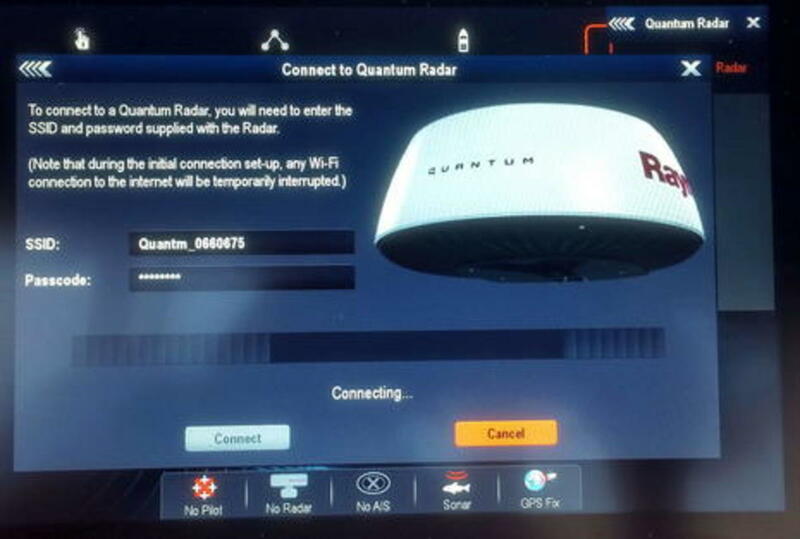 Moreover, the Quantum WiFi connection doesn&apos;t seem to affect Raymarine&apos;s other WiFi capabilities, which have gotten quite advanced. 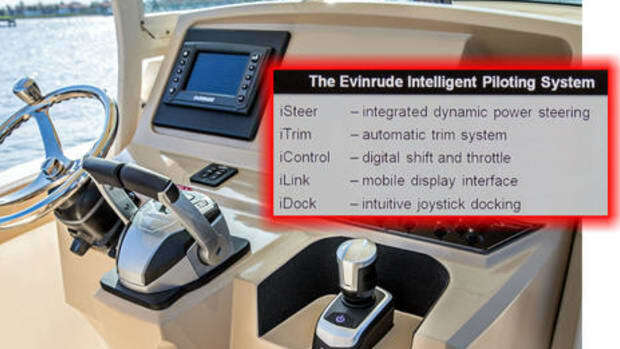 I can, for instance, still log onto the eS128 with my iPad or Android phone and run Ray&apos;s View, Control, or Remote apps. In fact, I can also have the eS128 join Gizmo&apos;s WiFi router, and if it&apos;s online, my mobile is also online. Yes, I&apos;ve seen Internet, MFD apps, and Quantum all working at the same time using just one MFD&apos;s WiFi, and performance was good all around. Can any other MFD do that? 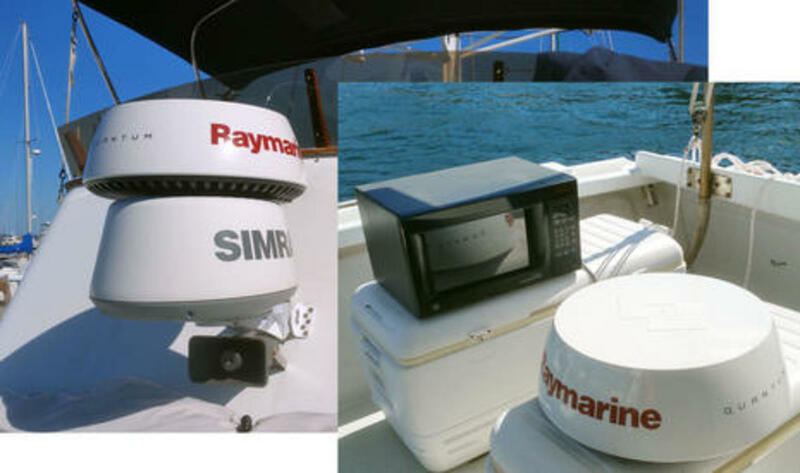 The Quantum install further challenged Gizmo&apos;s Raymarine network because it already included a RD418HD radome. No problem! 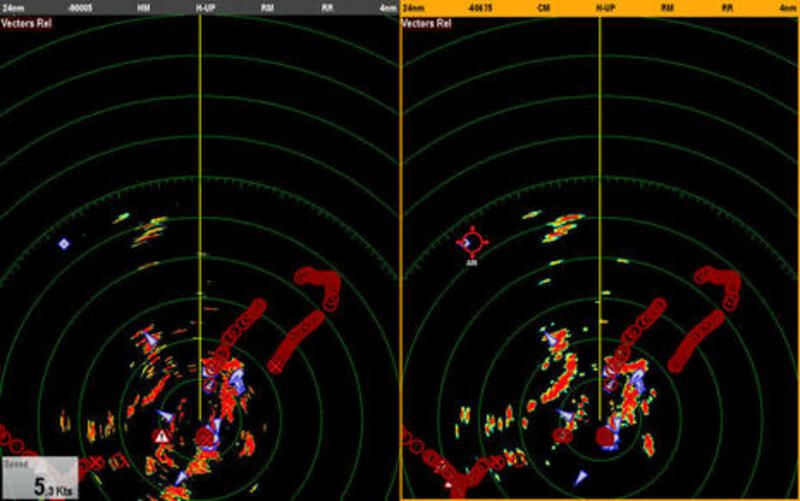 Both radars are available on both MFDs, even for simultaneous use. And note how the power button dialog box above lets you Power Down either radome as well as switch them back and forth between Standby and Transmit. 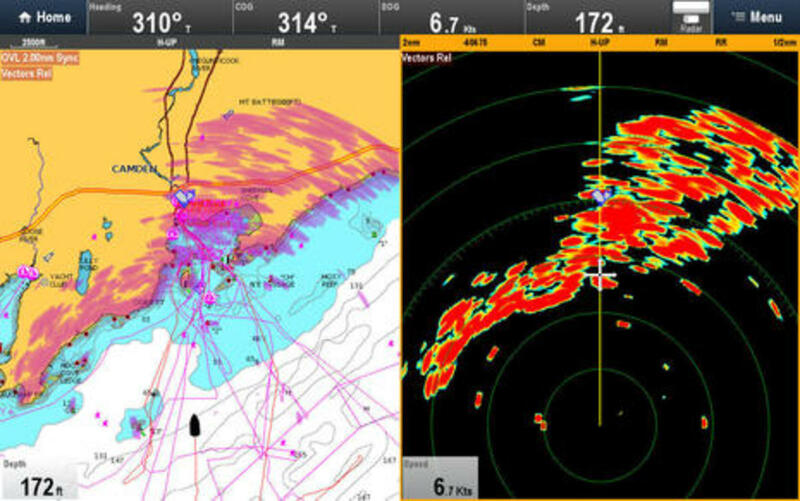 MFD radar power down is a valuable feature, especially for magnetron radars with high Standby power draws on sailboats, that I first saw on Raymarine and that has only been duplicated by Simrad/B&G to the best of my knowledge. 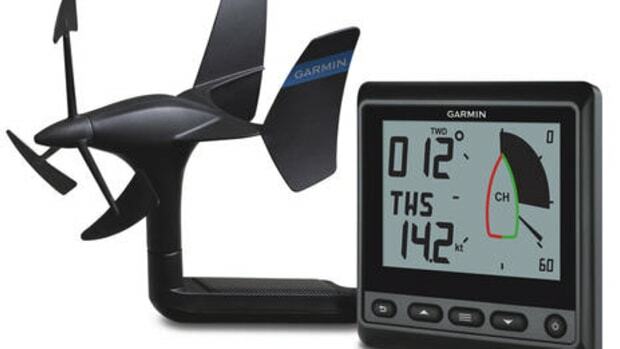 I do know that the only way I could run the current Furuno and Garmin MFDs on Gizmo with their radars shut down would be to put them on separate power switches, which seems crude. Here&apos;s the eS128 showing the magnetron RD418HD and the solid-state Quantum Q24 radars both at 1/8th nm range in target-rich Camden Inner Harbor. In this case the automatic performance was looking pretty good and also pretty similar, though I found that the Quantum was the one that could be improved by manually lowering the Gain. 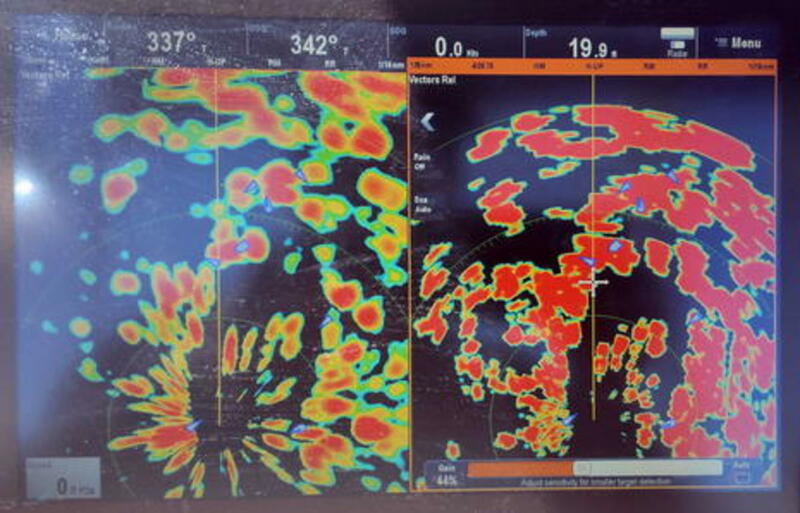 The real point of the photo is to show how the Gain, as well as Sea and Rain filter, can be seen and adjusted right on the touchscreen. The RD418HD and other Ray radars offer the same controls (if you choose to display them in Presentation Menu) and they work pretty well for me. Here I&apos;ve tried to show the various menu items that apply to the Quantum setup and display. You&apos;ll see that it offers four Preset Modes and that you can modify the active mode long term (which is different than simply manually adjusting Gain etc. for a short-term situation). I have not yet felt the need to change those presets. Note a fairly full set of Presentation choices, and that Echo Trails of various time periods are available elsewhere. I&apos;ve also tried to show how some menus need to be scrolled to access all choices, even though there is more room available on the 12-inch screen, a minor annoyance. 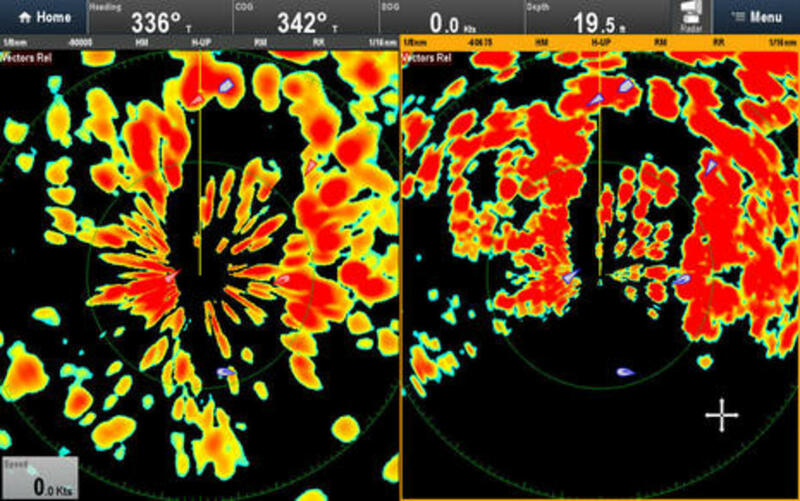 Now here are the two radars head-to-head at 24-nm range, though the screenshot seems to have been caught just before the HD image completely filled in. In practice the 20 Watt Quantum is not better than the 4 kiloWatt radome at longer ranges, but it seems nearly as good, even though the Quantum is mounted about 8 feet lower. That&apos;s impressive. 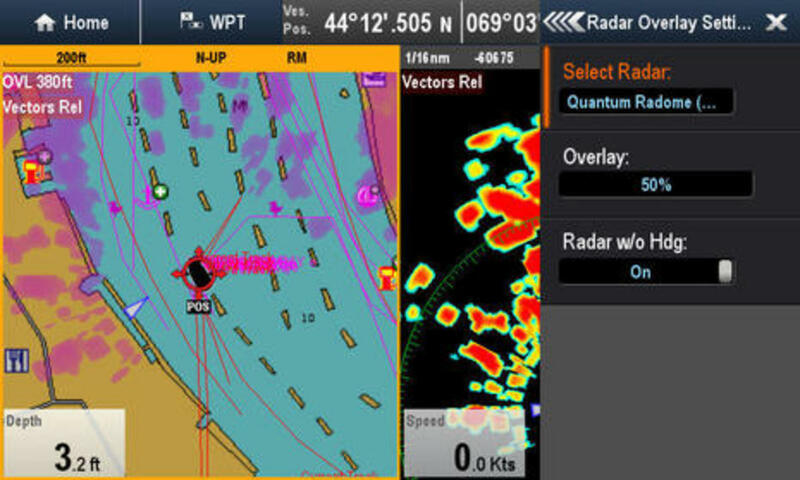 This screen also shows how you overlay AIS onto radar screens if you want, and that Ray is properly showing synthetic AIS aids to navigation (which have even come to Maine). 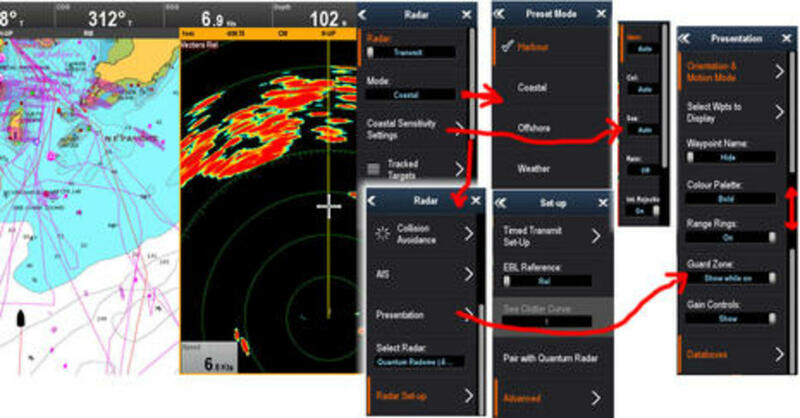 And, yes, I have been trying out the Navionics dock-to-dock autorouting that came to Raymarine MFDs with Lighthouse 17. I&apos;ve mostly seen smart results, though I do wish Ray would make it easier to hide all the waypoints generated. Unfortunately, most of HD to Quantum comparison screenshots did not capture the full screens, maybe because of the unsychronized scanning, but this image is true. What it shows is how completely the Quantum pulses are blocked by all the gear installed behind it on Gizmo&apos;s flybridge. I think that any radome would be somewhat blocked, and I&apos;ve tried several in that position, but solid-state radars are particularly vulnerable. 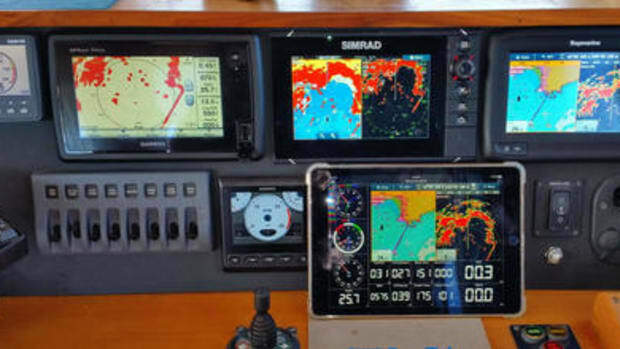 (The Simrad 4G does slightly better than the Quantum, but I think the 3G would be similar.) I intend to document more radar comparisons and also to move the Quantum to the mast, but onboard obstructions do seem a factor with this radar. This screen shows the Quantum doing good work at 1-nm range and also its relative and true vector MARPA abilities. The two targets I selected on the touchscreen (or with the eS&apos;s excellent cursor control) were small sailboats working slowly to windward, and the true speeds and headings being tracked in the radar window are close to what I could see with my eyes. 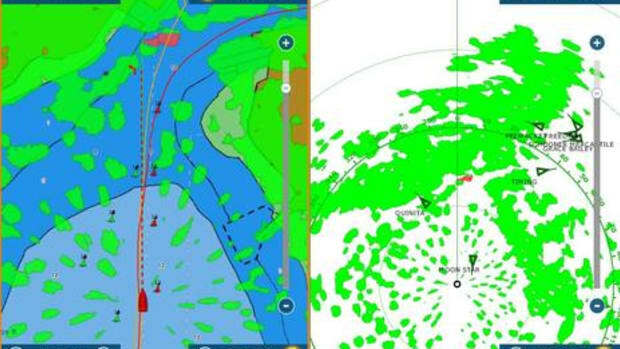 Meanwhile, seen on the chart overlay side is their motion relative to Gizmo motoring along at nearly 8 knots. 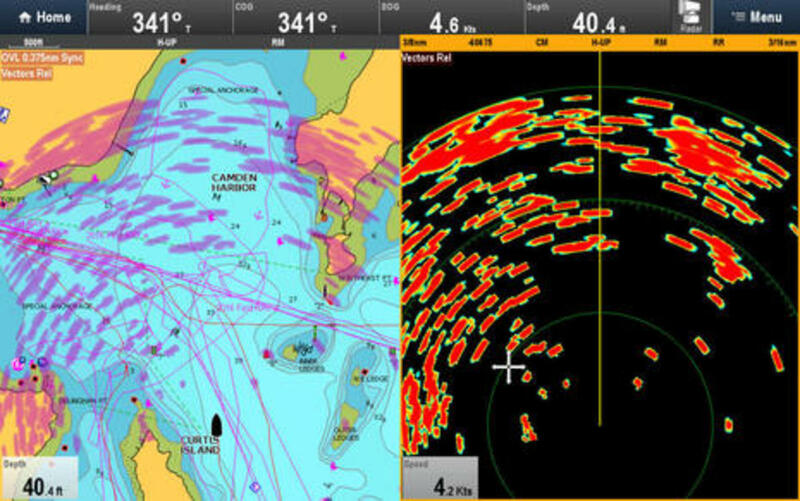 The Relative and True Vector calculations don&apos;t jibe precisely, but they&apos;re reasonably close, and reasonably close is the sort of MARPA performance I&apos;ve seen regularly from both Raymarine radomes. Note that one of those sailors either had significant local knowledge or took a chance with Merriman Ledge. 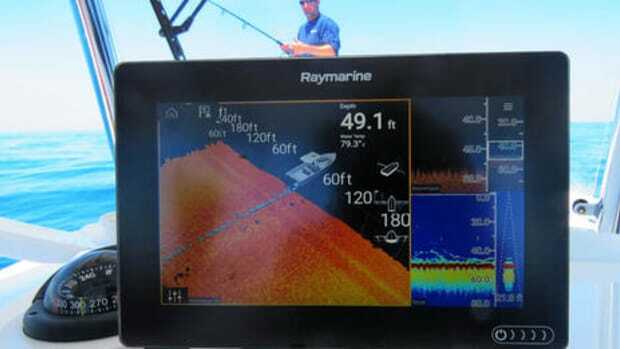 Unfortunately, Raymarine&apos;s MARPA is marred by two unchangeable alarms, at least for my taste. While the graphic display of how their MARPA alarm works is excellent, note that you cannot turn it off (like you can the AIS alarms) and that the minimal settings are 0.1 nm in 3 minutes. 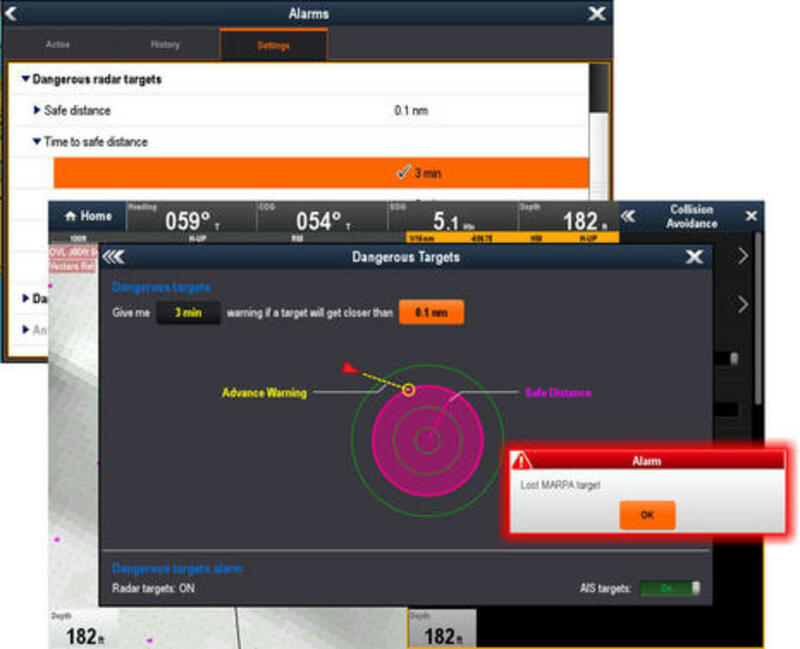 So if I target an approaching vessel a few miles away and the information helps me determine that a close pass is safe, I will still get alarmed. 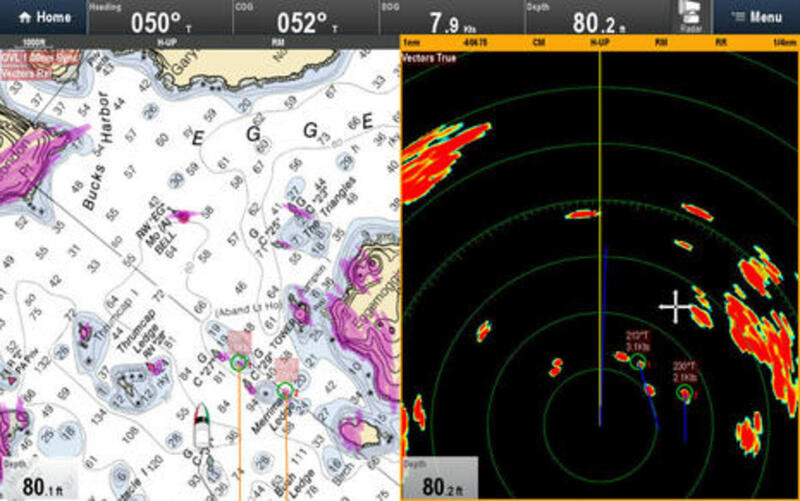 Plus I&apos;ll also get alarmed for every MARPA that the radar loses track of, and eventually that&apos;s every vessel I track unless I dig into the menus and cancel the targets. No doubt I&apos;m more sensitive than most about unwanted alarms because I run so many display systems at once, but those MARPA alarms seem even worse this season because they&apos;re firing off near the Furuno TZT2 and NXT radar that mandate no alarms while automatically acquiring intelligently chosen and quite precise ARPA targets even at ranges I&apos;m not viewing. 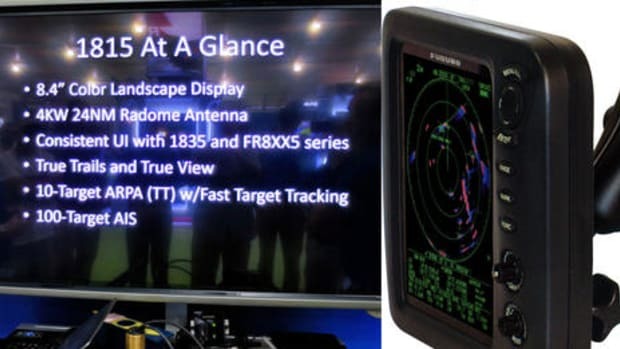 In fact, I don&apos;t think I can evaluate any new radar without thinking about the amazing and easy collision avoidance features Ive been seeing from the Furuno NXT. But even if the Quantum nevers get an update, I think that it&apos;s a very solid radar with a remarkable level of install flexibility at a reasonable price.